Nobody was quite sure what the young woman was doing in Paul Emile Chabas's painting, Matinee de Septembre, and that made it a bit controversial. Over the years, it was mostly dismissed as a serious work, although it hangs today in the Metropolitan Museum of Art. Not too shabby. Poor Paul Emile did not copyright her, so scores of reproductions were sold without him benefiting at all. Matinee de Septembre, Painting by Paul Emile Chabas, France, 1911. September Morn, Music by Henri I Marshall, Published by Jerome H Remick & Co, NY, 1913. 1. 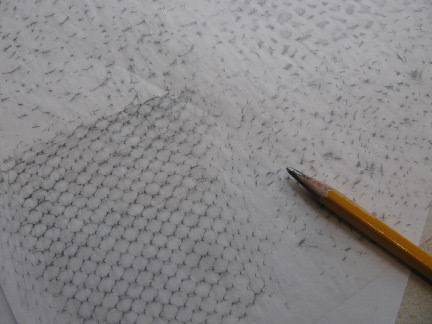 Use the side of a pencil to create some texture patterns on tracing paper. Fill the whole sheet. Spray them with acrylic fixative and allow to dry. 2. 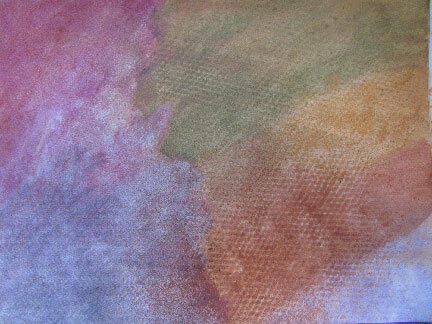 Cover the watercolor paper with a thin coat of light colored paint like Titan buff. Adhere the image(s) with matte medium. Brush some of the paint over the edges of the image. 3. Rip the tracing paper sheet apart and adhere the pieces to the background with matte medium. 4. Use red oxide paint on bubble wrap and around the edges. 5. 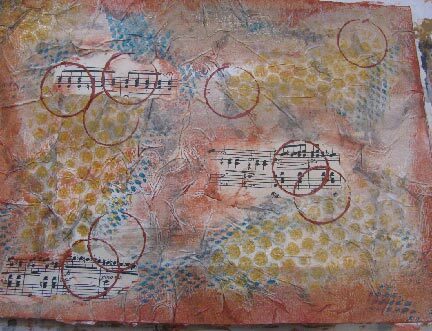 Add strips of sheet music using matte medium. 6. 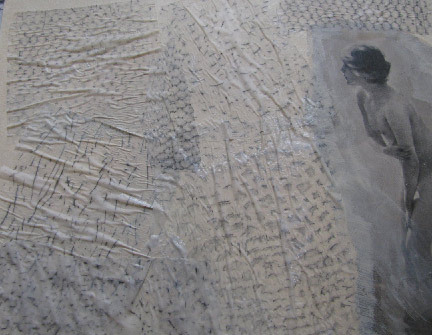 Add a layer of tissue paper with matte medium, allowing it to wrinkle. 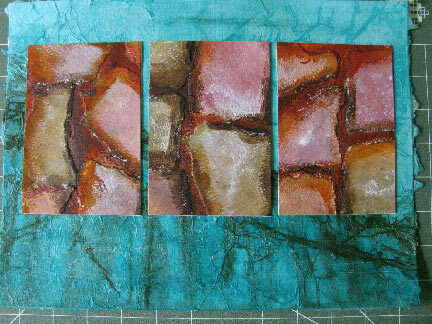 Add areas of diluted yellow ochre and cobalt teal, and drip India ink around the edges. 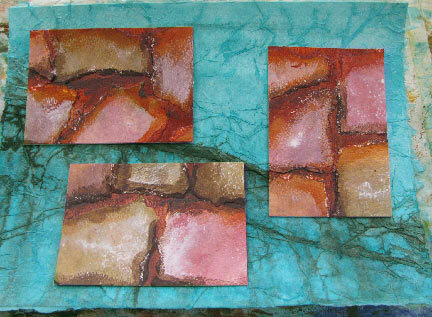 Allow to dry and seal with diluted gloss medium. 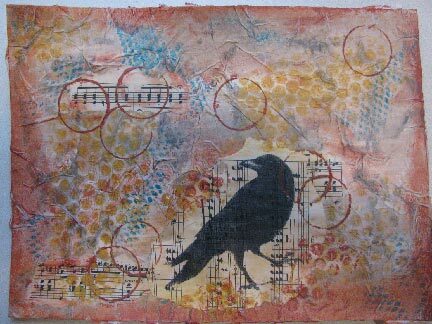 This collage on watercolor paper was fun to put together from start to finish, but it wasn't until just after I added the crow that the name and the point came to me. I had been discussing with a friend our tendency as human beings to want gifts that we don't have while undervaluing the gifts that we've been blessed with. My poor crow is clearly wishing for a musical talent that eludes him. Smart, clever, strong, and beautiful...he forgets about all of that! 1. 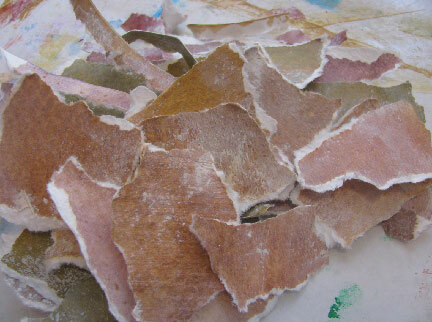 Paint the watercolor paper with Titian buff and allow to dry. Adhere tissue paper with thinned matte medium and allow to dry. Drip India ink and spritz with water to let it run. Dry completely. Apply a thin coat of gloss medium, followed by a "frame" of raw umber. 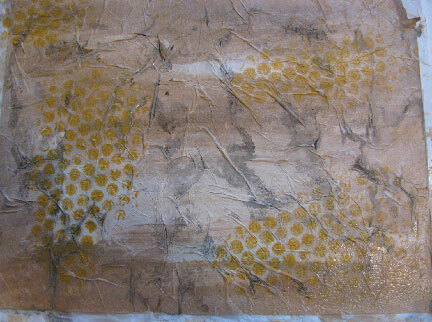 Add some yellow ochre on bubble wrap. 2. 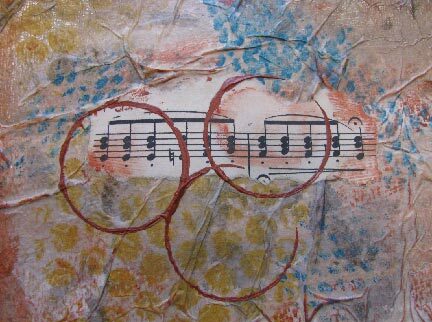 Add strips of sheet music with matte medium. 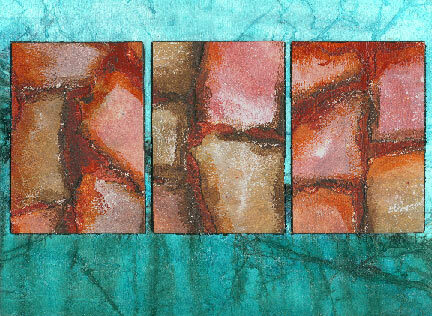 Accent with red oxide, and with cobalt turquoise stenciled through a plastic vegetable bag. 3. Make marks with the bottom of dixie cup dipped in red oxide. 4. Print out an image on sheet music (cut to size for your printer). Adhere with matte medium. Allow to dry completely. 5. 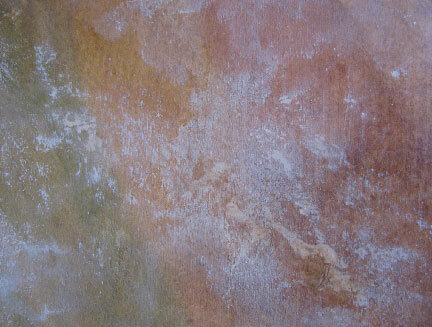 Glaze with yellow ochre. I have always enjoyed a day of making background papers. When you allow yourself to play with no pre-conceived idea of what the results will be used for, all kinds of interesting things can emerge. I gathered together a large number of supplies...nowhere near as many as I could have, but more than were absolutely necessary. Do you need all of these things? Nope. Be guided by your own supplies and your own aesthetic! 1. 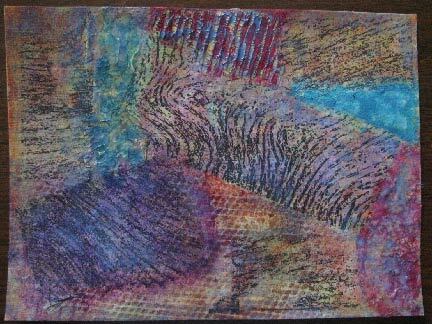 Iron some tissue paper to a piece of freezer paper and print out some interesting textures. I used some photoshopped black and white close-ups of bark. Adhere them tissue side down to a piece of watercolor paper with matte medium. Let them dry completely before attempting to peel off the freezer paper. 2. Spray walnut ink through stencils onto some areas. 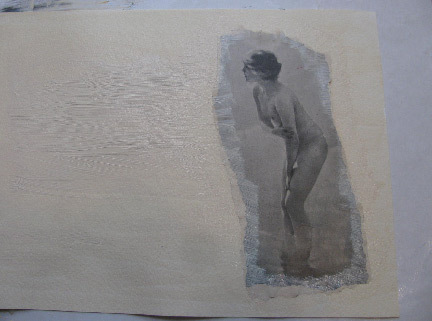 When dry, cover the entire sheet of paper with a thin layer of matte medium. 3. 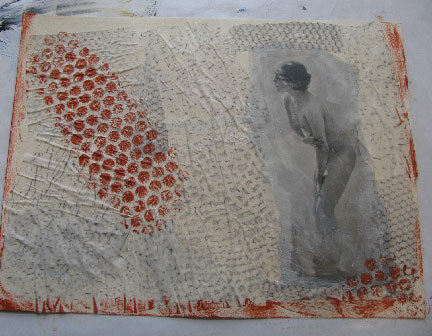 Add texture to other areas of the sheet. 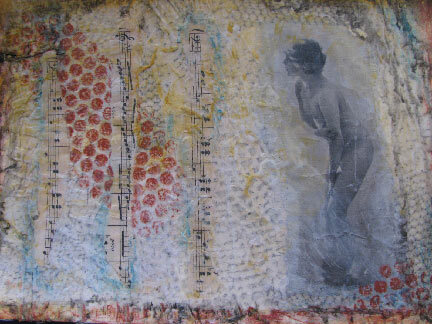 I used extra heavy gel medium pressed with corrugated card board (shown above), and other materials like opaque fiber paste and gesso, matte medium and cheesecloth, and matte medium and waxed paper (not shown). 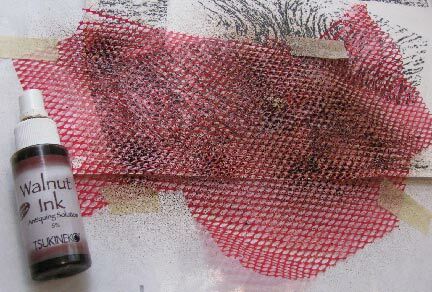 Remove the texture materials pressed into heavy gel immediately, but leave items embedded in regular medium until they are close to dry before removing. 4. 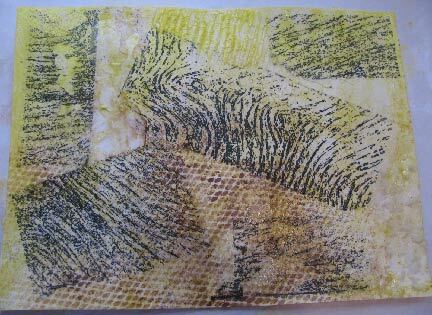 Add a thin layer of yellow acrylic to the whole sheet. It will puddle somewhat on the textured areas. Allow to dry. 5. Paint textured areas as you choose. Allow to dry. On some of them, I sprinkled rubbing alcohol to make the paint bubble. 6. 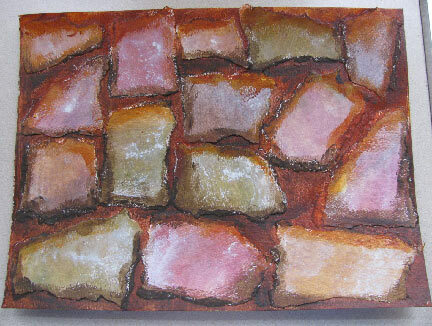 Add a glaze of any color you choose to unify the sheet. I used cerulean blue. 7. Optional - I decided that the colors were too bright and bold for my current mood. There's nothing wrong with step 6, and perhaps it could have been the final result. 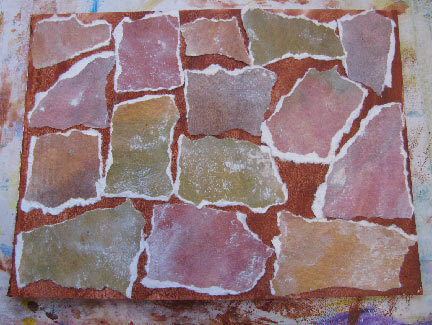 But I added one more layer of yellow ochre to the entire sheet, and was very happy with it. Before doing that, I scanned step 6 in photoshop, so even though I no longer have the physical piece, it exists in digital form for me to use if I ever want to. Isn't technology great? Last week, I showed you the techniques for creating the rocky postcard shaped pieces. Today we're going to look at how to finish it up! 7. 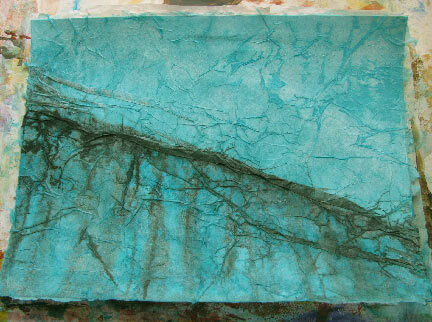 Paint another piece of watercolor paper with turquoise colors. Allow to dry. 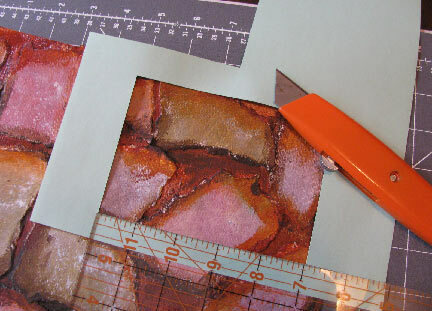 Add a dilute layer of matte medium and top with tissue paper, forming a diagonal line and allowing plenty of wrinkles. Allow to dry. 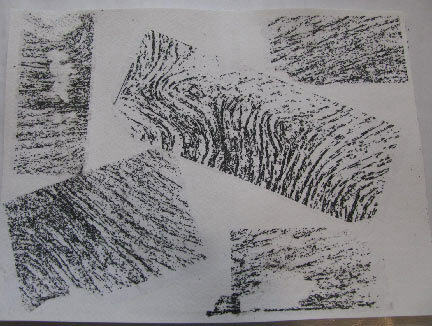 Use dropper or brush to apply India ink along the diagonal line. Spray lightly with water and allow the ink to run downwards. Allow to dry completely. Spray with acrylic fixative, and add a layer of matte medium to the top. 8. Mess around with the placement of your shapes. 9. This is what I chose. Paint some matte medium on the back of your rock shapes and allow to dry. Darken the white edges with ink or dark acrylic paint. 10. 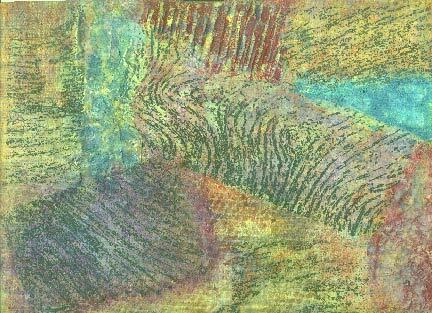 Use a bit of matte medium to stick them in place and press with an iron to fuse the postcard shapes to the background. Here's a silly question...Do you have fabric left over from various projects? 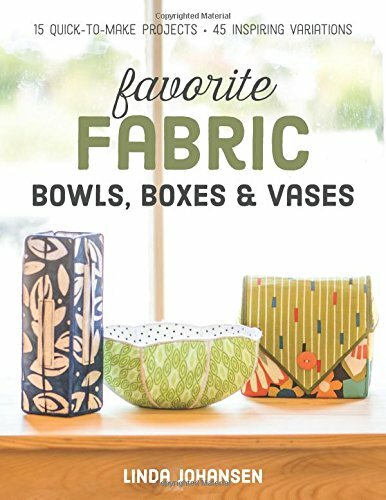 I have had so much fun with the instant gratification of making fabric bowls, as well as the artistic side of combining fabrics and threads and shaping a bowl to fit my mood at the time. I use the bowls throughout my house as functional art on tables and counters—holding treasures, candles, and food. As I played with making fabric bowls and taught others how to make them, more possibilities kept popping into my head. It was a natural progression to leap from fabric bowls to fabric boxes. Once you've read through the basics and learned the easy to follow techniques, you'll be all set to launch into the projects. The book will be out in June from C&T Publishing, but it can be pre-ordered now! 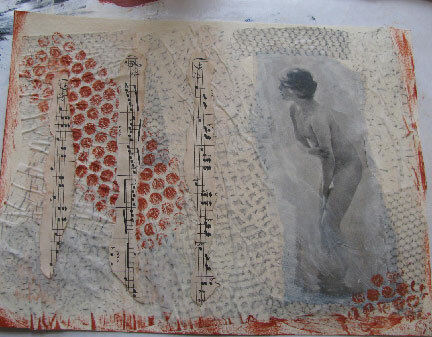 When I started with this collage, I had absolutely no idea where it was going. Each step seemed to just suggest the next one to me, although at the time I didn't know what the end game was. Not until it was finished did the idea come to me from the old hymn, "All other ground is sinking sand." As soon as I thought of that phrase, the point of the collage seemed obvious to me. I've included information on the colors and shapes I chose, but you should chose what you like best and just use this tutorial for its techniques rather than to make a duplicate. Make something meaningful to YOU! 1. 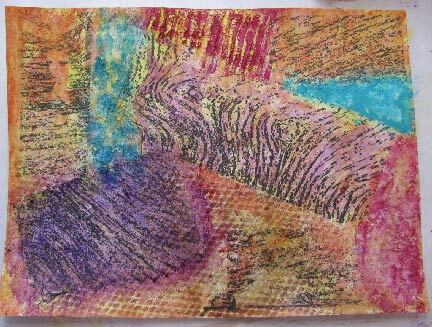 Glaze paper with Titian buff. While still wet, add patches of color. Allow to dry. Spray with inks (I used a vegetable bag as a stencil). Allow to dry. Top with a layer of matte medium and allow to dry completely. 2. Add a light coat of gesso and spritz with water. 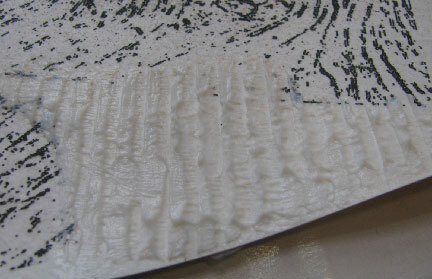 Spray with alcohol to create a foamy texture. Allow to dry completely. 3. Add matte medium to back and allow to dry completely. Tear up. 4. 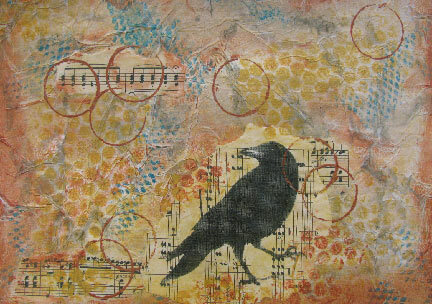 Paint a piece of watercolor paper with golds, browns, and blacks. Arrange torn pieces on top and adhere when satisfied. Add a bit of matte medium to stick them in place and press with an iron to fuse the medium from step 3 to the brown background. 5. Use diluted dark brown or black around each torn piece to blend them in. 6. Cut a window in a piece of scrap paper the size you want and Cut out pieces that are about postcard sized.